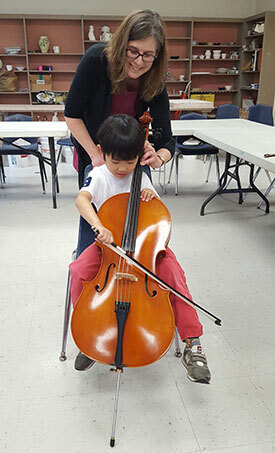 Wayland School of Music welcomes a wide variety of students, ranging in age from 4 to 85 and with an equally broad range of goals. Our programs will support you in developing and reaching those goals, whether you are a recreational musician of any age, a student wishing for support in your school music programs, or an intensely-focused musician aiming towards competitive programs or a potential career in music. Private lessons are the cornerstone of music study. Our private lesson teachers will help you develop all aspects of playing an instrument—not just improving your technical skill, but also finding and nurturing your own personal response to the music, and becoming comfortable expressing and sharing that inner musical spark with others. We support you in becoming an empowered and confident citizen of the world of music. Our Suzuki program has now expanded to include violin, viola and piano. We offer both introductory group classes, and a full Suzuki program (for some instruments) of private lessons plus supplementary group. Music brings joy to audiences as well as performers, and our twice-yearly school-wide recitals at a senior residence are our way of giving back to the community. In addition to these larger recitals we give other informal performances at venues such as libraries and supermarket forecourts. Some video of our performances can be viewed here. We encourage any student who is beyond the very beginning stages to discover the joy of playing together with others. Our Chamber Music program is a wonderful way to expand your musical enjoyment. We will match you with others of similar age and playing level, and coach you in listening and ensemble skills as you discover the fun and the give-and-take of playing together. This will also help you to contribute confidently in larger groups such as school orchestra and band, community orchestras and youth orchestras. For our youngest students, or others not quite ready to take the plunge into private lessons, we offer a changing selection of Group Classes. These may be general classes or geared towards specific instruments. If you don’t see the group class you’re looking for, please ask us!